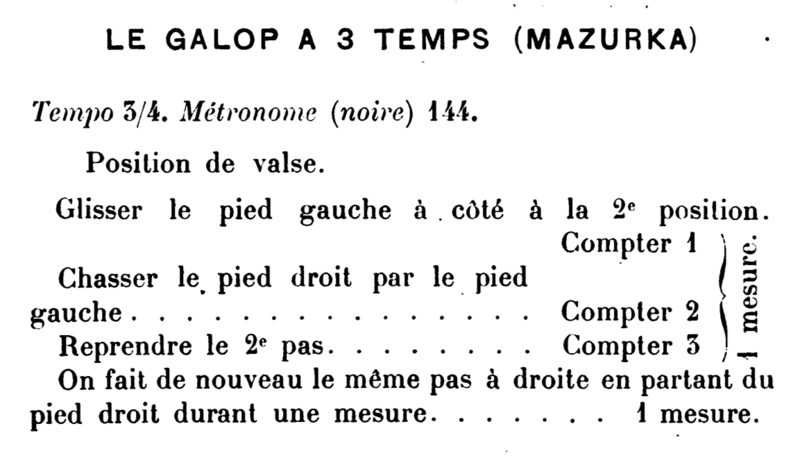 The Three-Slide Galop is a fun adaptation of Galop to waltz time, which appeared in De Garmo's Dance of Society (1875) and several other manuals in the late 19th century. 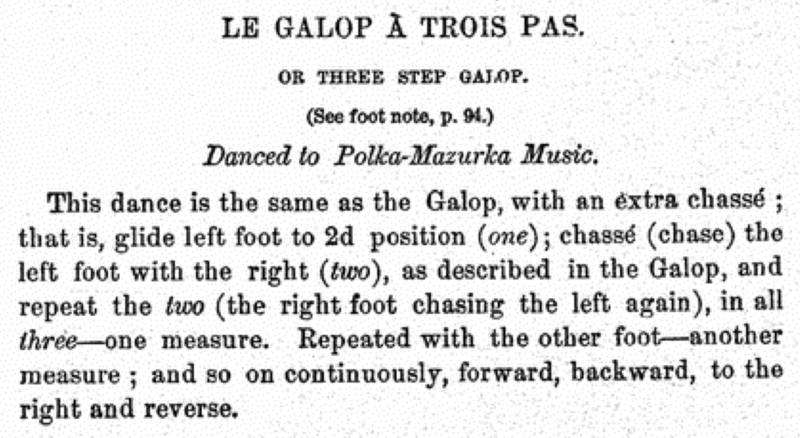 Before introducing the Three-Slide Galop, De Garmo notes that "while a Polka-Mazurka is being played, one couple may dance the Polka-Mazurka, a second couple the Polka-Redowa, a third the Galop à Trois Pas, a fourth a slow Redowa, a fifth a slow Waltz, and a sixth couple the Glide Waltz." While De Garmo himself wasn't happy about this state of affairs, the fact that he was unhappy about it demonstrates that it was the state of affairs, with the different forms of waltz being freely mixed at the dancers' discretion, regardless of which particular danced was called—something that we still see happen quite often today! [WD75]. 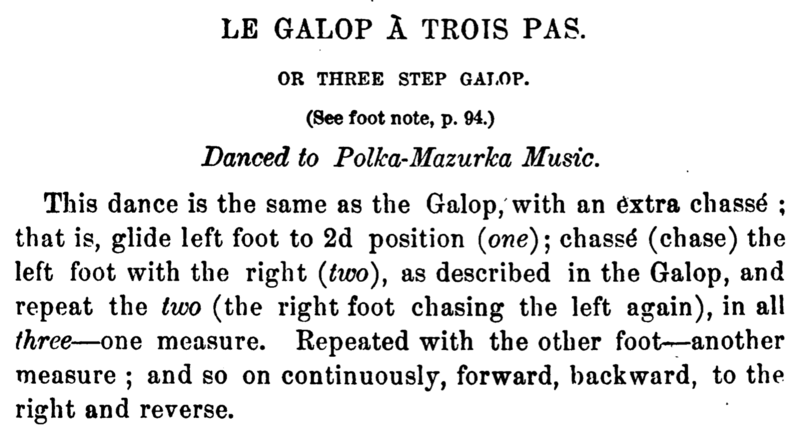 Halfway between a Four-Slide Galop (four slides), and a Polka (two slides), it's simply a galop with three slides, turning on the third count, i.e., "slide-and-slide-and-turn." One author notes that it can also be reversed, turning to the left instead of the right [e.g., WD75]. Metronome markings range from 112 bpm [AD85] to 144 bpm [WL03]. WD75 — William B. De Garmo. (1875). The Dance of Society. New York. WD79 — William B. De Garmo. (1879, March). The Dance Of Society (Third Edition). New York.